A magnificent castle keep, complete with walls, watchtowers, well, fountain, and stable, all dramatically sited on the slopes of an active volcano! It just needs a murder, and then it will be haunted as well. 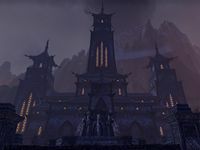 Ebonheart Chateau is a player manor in central Stonefalls. It features a stable and a tower which commands an impressive view over the nearby lava flows. A large fountain dominates the main courtyard. The castle itself has three floors, connected by two sets of stairs on either wing. The lanterns, lightposts, and stone blocks found here (even when unfurnished) are enough to earn you the Lighting Decorator and Structural Decorator achievements immediately upon entering. Purchasing this home will also earn you the Councilor achievement, and its corresponding title. This house was added to the game world in Update 12, causing a relocation of Stonefalls Treasure Map II.